Long range Wi-Fi Access :) – Do your dream! For the purpose of the test I used BackTrack3 Linux toolkit rather than Windows as it allows a lot more control of the WiFi cards. So though you may not recognise the screens it doesn’t matter as its for testing only. Please note all images can be clicked to zoom in, but I’ve blurred the MAC/SSID details for personal/security reasons. Sitting at home I performed a scan of all available networks using a standard WiFi card. As you can see there are a few networks in range but not many. As you can see in the PWR column only 2 have power in double figures and in order to maintain a connection you really do need double figures – thus only mine and my direct neighbours is accessible. So first impressions are, most definately, it does what it says on the tin! 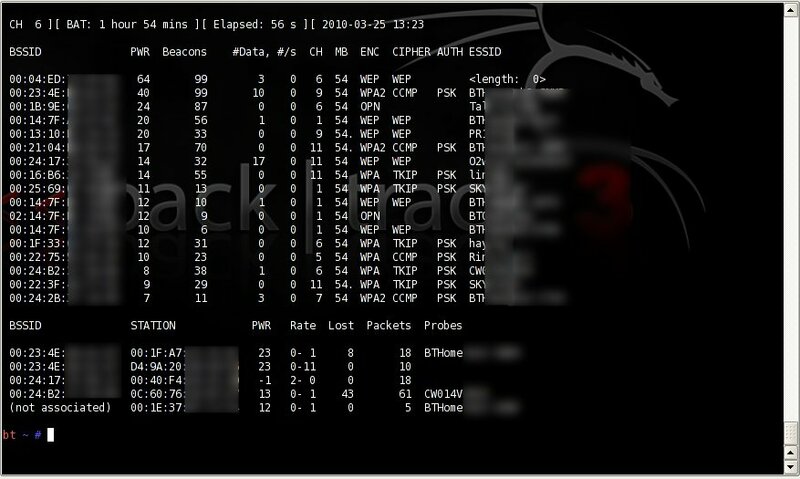 What that bascially means is that it does support the method of obtaining the security keys of WEP encoded networks. As can be seen above, even though the network tested was out of range under a normal wifi card, I was able to detect and obtain the security key, then within Windows connect to their network and have full internet access*. For the money? Yes – fully recommended. It also gives me confidence in the claims of some of the more expensive devices. This one is rated at -9dbi which, they say, is 500m range. From my tests I have no reason to doubt the 500m range though I would suggest the range would be maybe half that in a built up area. In the box you get a couple of brackets and mounting kit though I expect I’ll just move mine around as and when needed. If you buy from the Amazon link – look at the “people who bought this also bought” area and get the suckers as well which you need to stick it to the side of the van. It comes with a manual and CD (which, being a bloke I didn’t even look at), instead I simply plugged it into the laptop and let Windows get the drivers direct from Windows Update. So fairly idiot proof! This review was undertaken on the rocket aerial below which, I love and recommend, and pretty much everyone who has seen it work has bought one! Bargain at the price. There are other options for long range wifi, but this rocket works and is simple. Stick it up, stick it in and hey presto. Some other options are more difficult (such as having to “aim” the device) but these should be considered if you like playing. *Note: I’m obviously talking theoretically as I would, of course, not ever recommend nor approve of anyone using anyone elses network without permissoin. Thank you for all that. Do you have any updates on your findings? I clicked the link on the no.2 product (July 2010) and it is out of stock. Shame, it sounds as though it’s just what I need to use my laptop in the MH while in EU. Thanks for letting me know – I will update it. We use the “rocket” which is the cheapest one, and this is fine especially in built up areas. I’ve not tested the longer range ones and, to be fair, I’ll see how we get on with the small one on our next trip before I decide to expand it or not. They have a £20, £40 and £100 adapter. I know the £20 one works well, my research on the £100 suggest it had issues with Vista? But that was a while ago. So suggest the £20 one. Pingback: Is Open Unsecured WiFi safe to use? Just be aware that this product (rocket) does not operate on the latest faster “n” WiFi standard, But only the b/g standards. Also have a look at “Happy Campers” (who are I believe Ryan and Mel) 1 star comment on Amazon re alternatives.